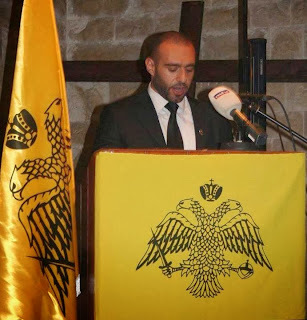 According to the Arabic-Language Media site, “Lebanon Files”, Rodrigue ‘Dimitri’ Khoury, head of the Antiochian Greek Levant Party was stabbed in the neck in Tripoli. Reports claim that Khoury was attacked by masked Salafists while out with friends. Khoury’s official condition is unknown; however, sources claiming to be close to him are saying he is alive. The Levant Party, just recently held a rally outside the Turkish Embassy in Beirut, for the release of 12 kidnapped Greek Orthodox Nuns in Syria by Jihadist rebels. Jabhat al-Nusra, the Al-Qaeda linked Jihadist militant group, which is currently committing Genocide against Syria’s ethnic Greek, Armenian, and Assyrian minorities, follows a hard-line Salafi Jihadist ideology.